The apartment is located in Rome in Via Trasaghis in an elegant residential district of "Colli d’oro" between Via Flaminia and Via Cassia, one of the greenest areas of Rome. The house is very bright: is on the seventh floor of an elegant building and has a splendid terrace.From "Chez Gabrielle" do not feel the noise of the city, although it is very near the center. Nearby you can find every kind of service: bank, cash, supermarket, pizzeria, newsstand, pharmacy and bars. Only 200 metres walk you will find the bus stop (line 037) in 10 minutes takes you directly to the metro stop of Prima Porta and 15 minutes will be a Flaminio/Piazza del Popolo (The owner offers free transfer to the metro stop, so that with only 15 minutes will be center). 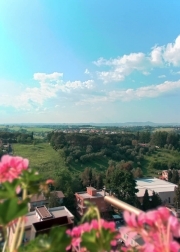 The apartment is located in Rome in the residential and elegant district of "Colli d’oro" between the Via Flaminia and the Via Cassia, one of the greenest areas of Rome. The house is very bright and has a wonderful panoramic terrace of 20 square meters. It is composed by a room service, a bedroom, a bathroom and a wide kitchen. In the bedroom further, you find a sofa with 2 beds. In 15 minutes by underground you will be to Piazza del Popolo. Since the apartment adjacent to the main house, the owner offers free transfer to the underground stop. At "Chez Gabrielle’s” firmly believes in the value of hospitality and tourists are welcomed, care and kindness. You will feel at home. The apartment has the advantage of the breakfast included in the price. It is also equipped with parking in the garage, air conditioning and internet connection with wirelss network. The house is equipped with armored door, double glazing, central heating, air conditioning, safe and connecting to wireless internet. 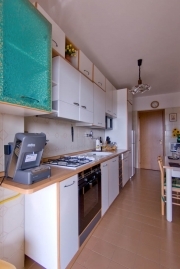 Kitchen: is complete with everything you need: TV, refrigerator, freezer, dishwasher, oven, a microwave oven, toaster, juicer, blender, coffee machine expressed "Lavazza", pots, plates and dishes. In addition, you will find everything you need to prepare a full breakfast. The room is furnished with a double bed, sofa with 2 single beds, a desk, color TV and DVD player. The bathroom with tub-shower comes with a hair dryer, linens and soaps. In the room service there are three cabinet doors with drawers, shoe provided necessary for cleaning shoes, washing machine, the tool axis and iron. The terrace is a comfortable furniture with chairs for enjoying the relaxing breakfast or meals. Tiburtina Station: FR1 line up to Settebagni (possibility of transfer). From the Airport Bus until Anagnina underground station Line A (possibility of transfer).